Price per m2 (square metre) Product Information Another classic, this tile has a tumbled finish unlike its 'sister' tile which is brushed. 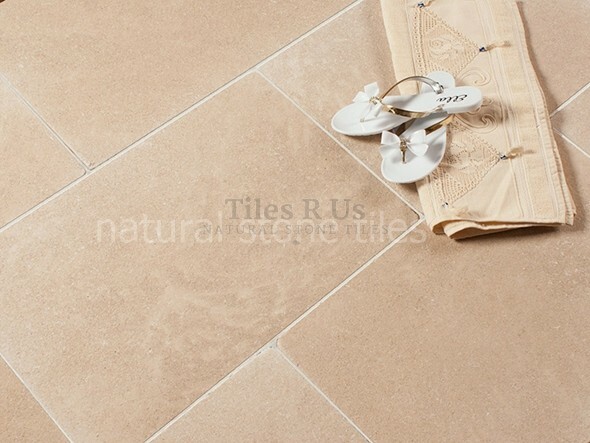 Now we have the beautiful tumbled finish as well featuring a warm beige colour and of course that traditional tumbled surface, these tiles will be a perfect addition to your property.Tumbled tiles add great depth to your floor, the 'rough and pitted' surface with naturally 'broken' and rounded edges and corners adds that touch of ancient traditional flooring, natural stone at it's very best. It is the process used that gives this tile its character - the tiles are vibrated & tumbled with small abrasives to produce just the right aged appearance. There might be slight variations in colour, but veins and other patterns are generally absent.Click here to check our TILING ESSENTIALS range including tile sealer, tile cleaner, tile adhesive and tile grout; we only supply carefully selected Tiling Essentials for Tiles R Us. Adhesive: Flexible standard set or fast set adhesives Grout: Flexible narrow joint grout or flexible wide joint grout Tile Sealer: Mattstone tile sealer Tile Cleaner: Grimex stone tile cleaner Tile Maintenance: Waxwash Please note the information above refers to Tiling Essentials when used for indoor or outdoor applications; for external use we suggest you consult your builder to check for suitability or ask us for adviceClick here to check our NATURAL STONE TILING MADE SIMPLE guidelines and tips - Tiles R Us are unique and natural make sure you get the first step right and you will be very pleased with your stone tiles project.